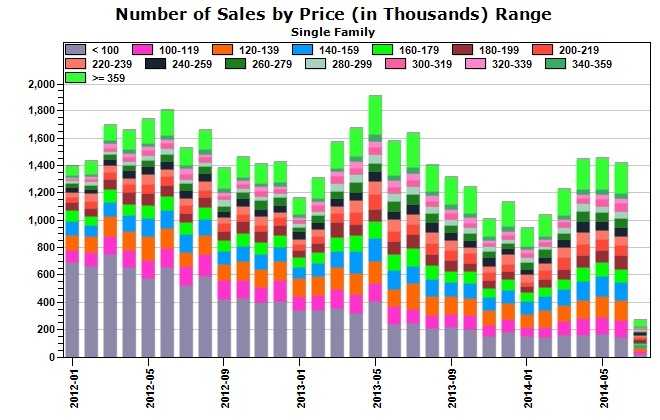 Median sales prices are up year-over-year. However, there is a phantom in those median price increases, or apparent appreciation. It’s in the ‘mix’. 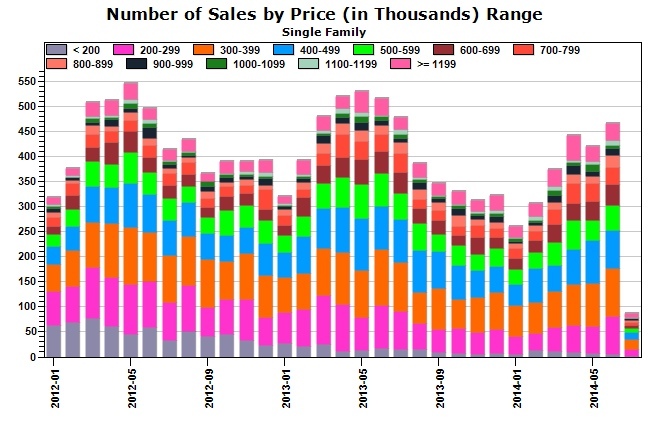 Reported sales data often lumps together ‘normal’ sales, REO (bank owned) and Short Sales. It’s old news the distressed market has been substantially erased with investor purchases. Today’s market is dominated by ‘normal’ sales. Since distressed were primarily lower-end properties, we now find substantially fewer homes under $100K. That’s the story. 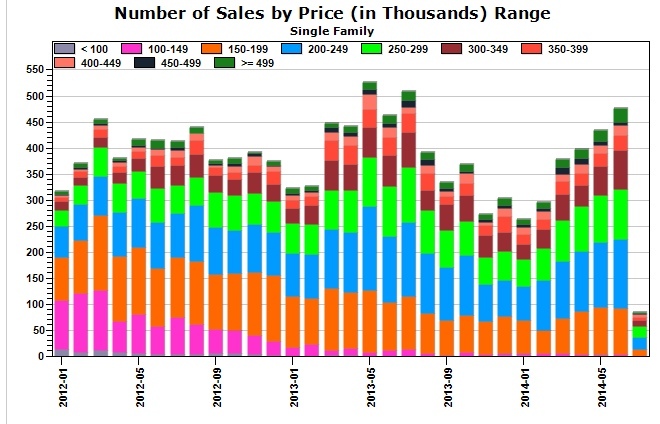 And the higher proportion of normal sales absent those lower-end distressed sales has artificially raised median prices – phantom appreciation. 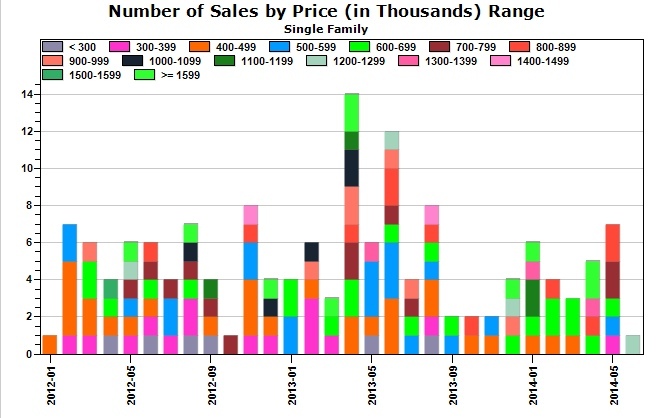 We can graph the shift in the mix by looking at the monthly sales grouped by price range. 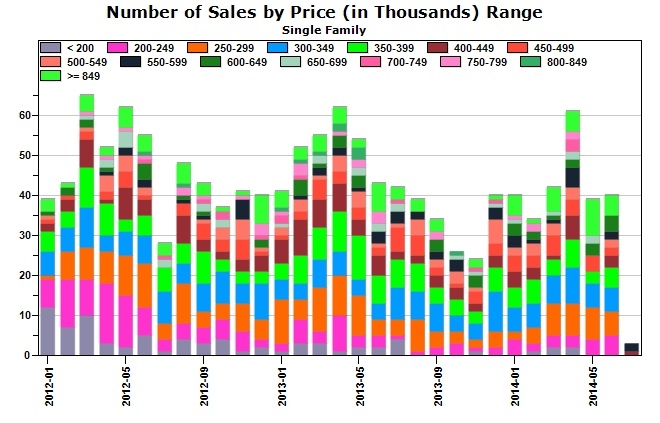 It’s also instructive, as we literally ‘see’ the proportion of lower-end properties disappearing from the market in the month-over-month price range trends. Below are a series of charts from select cities across Arizona. Each chart covers 2012 to current. 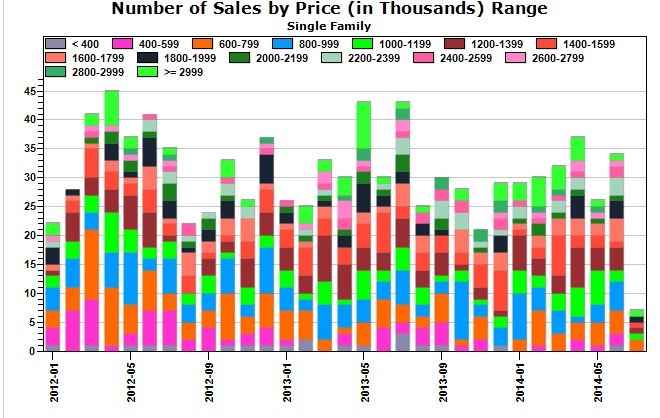 Each vertical bar represents the volume of sales activity. The colored bars represent the relative amount of volume by price range. The price range color key to the bars are shown along the top of each graph. Again, the thing to notice, that you can readily see, is the shrinking to almost non-existent under $100K market in most cities. Click on the city of interest to enlarge. Fewer lower-end listings equals fewer lower-end sales. It’s tougher to qualify for the higher priced starter homes. Many would-be homeowners are now renters! However, lack of affordable inventory isn’t the only factor giving younger millennial buyers pause. But that’s another story. Move-up buyers are increasing gradually as equities return. While ‘Phantom Appreciation’ does skew the overall stats, the issue is negligible in the mid to higher-end sectors as most sales have been and continue to be driven by ‘normal’ sales. As an example, year-over-year appreciation in certain market sectors of Scottsdale’s high-end Desert Mountain Community show appreciation of 25%! This is not typical, but makes the point that appreciation stats vary greatly and can only be accurately assessed within the local community and price range of interest. Of course, this is what we do as your Realtor. Generally speaking, the luxury market is stable, albeit seasonally slower in both supply and demand as many Arizonans head for higher ground or the beach!